It was late at night during Ramadan when Fatou Mbaye had to make some fast decisions. A pregnant woman had just stumbled into Tanaf Health Post, where Fatou works as a midwife. It was clear the woman was sick. A quick examination pointed to preeclampsia, a dangerous elevation in blood pressure that can be fatal for both mom and baby. But what to do? 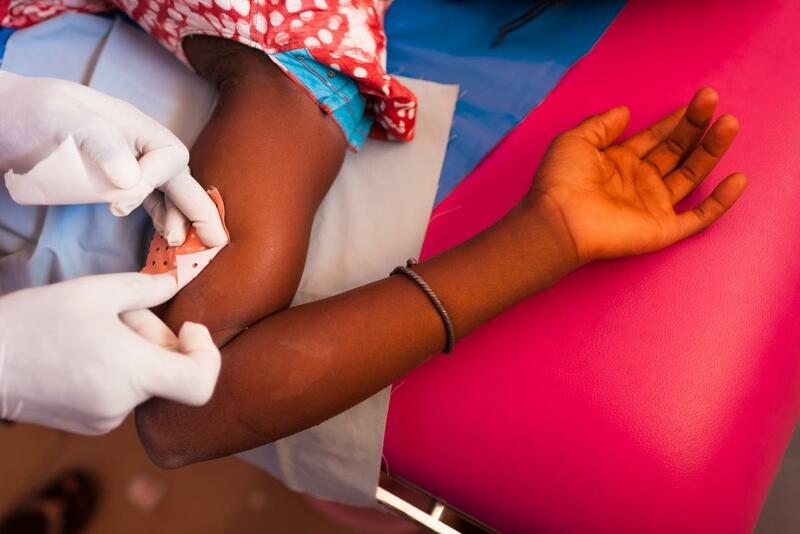 The woman needed more specialized care than the little health post in Senegal’s Goudomp district could provide. She needed the hospital on the other side of the Casamance River, which meant she also needed transport and money, and she didn’t have either. So Fatou—very pregnant at the time herself—loaded the woman into a narrow wooden boat that night and took her there. 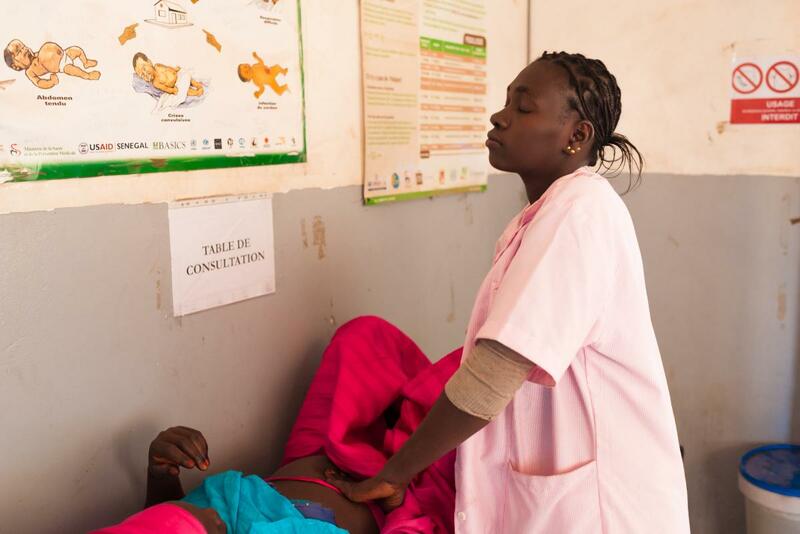 Fatou Mbaye conducts a prenatal exam at the Tanaf Health Post in Goudomp district, Senegal. Fatou always wanted to be a midwife. As a child, she spent whole days watching her mother, a hospital matron, as she worked. Photo by Clement Tardif for IntraHealth International. That was three months ago. Today is not so stressful, Fatou tells us. It’s busy, of course—she sees around 30-40 clients every day. But the sun is shining and there are no emergencies so far. Just the usual cases of diarrhea, malnutrition, sexually transmitted infections, and—most common of all, for Fatou—prenatal visits. At the moment, she’s conducting a prenatal exam with a client who’s pregnant with her fifth child. When the woman sits up from the examination table, Fatou hands her three tablets of sulfadoxine and pyrimethamine and a cup of water. The client swallows the antimalarial pills and Fatou makes a note of it in the health post’s register. All of this seems very routine, but in fact Fatou has just delivered a crucial element of comprehensive maternity care in Senegal. Malaria rates have been dropping in Senegal (between 2016 and 2018, they fell from 17% to 10%) but it remains endemic in the country. And it’s particularly dangerous for pregnant women. The parasite is known to target the placenta and can cause a pregnant woman to develop anemia, give birth prematurely, or even lose the fetus. Clients with first-stage malaria can get treatment here at the Tanaf Health Post. Severe cases, though, require a visit to the hospital across the river. The post’s ambulance has long since broken down, so women who need to get to the hospital fast must figure out transportation on their own—usually renting a car. Photo by Clement Tardif for IntraHealth International. Before the IntraHealth International-led Neema project came along, Fatou says, women would come to the post for occasional malaria treatment, but unless they returned on their own, there was no way for health workers to follow up or make sure they were getting all the meds they needed. With Neema’s help, they’ve developed a case-management system that fills their data gaps and improves care at the post. Take the client Fatou is talking with now, for example. Now that her information is recorded and up-to-date in the register, Fatou will stay in touch with the community relay—a community-based worker who lives in the woman’s village—by phone to ensure the woman keeps taking her preventive medicines and is staying healthy throughout her pregnancy. 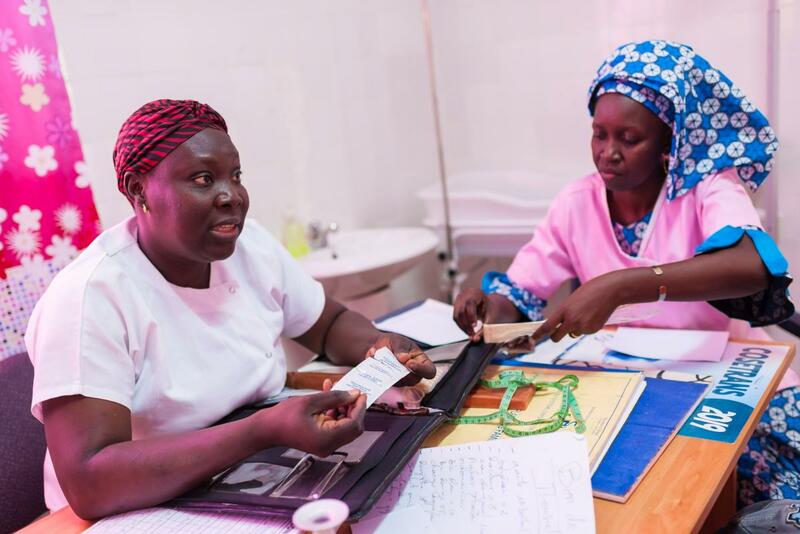 Because of this upgraded recordkeeping and follow-up, Fatou says, they’ve seen malaria rates among pregnant women at the post drop from 3% in 2016 to 2% in 2018. Demand for family planning, on the other hand, is on the rise. Just yesterday, Fatou saw a client pregnant with her fourteenth child—it was the woman’s first prenatal visit, though she was already in her third trimester. This is a common trend among women in rural Senegal, which puts them at greater risk for complications during pregnancy. Once yesterday’s client has given birth, Fatou and her colleagues will offer her post-partum family planning—another crucial element in maternity care that’s now becoming more systematically available at health posts in the region. A pregnant client takes her medication to prevent malaria at the Tanaf Health Post. Photo by Clement Tardif for IntraHealth International. Seventy kilometers away, at the Goudomp Health Center, midwife Fatime Gueye opens a black case and begins pulling out samples. There are pill packets, implants, an IUD that nestles perfectly in a life-size plastic uterus, and every other contraceptive option the center caries. Fatime gives her clients a full tour of this case during consultations on post-partum family planning, a new service they offer to women after they’ve given birth. “Before, if a client didn’t want family planning right away after birth, she would move back to her own family for two years,” says midwife Fatime Gueye (left) at the Goudomp Health Center. “Her husband might come visit during that time, but not often. Obviously, this causes a strain.” Post-partum family planning helps ease the burden, she says. Photo by Clement Tardif for IntraHealth International. Fatime and her colleagues have long offered some family planning at the center, but the post-partum consultations are new. And the training IntraHealth provided on this counseling also helped update the health workers’ knowledge on a few key topics. There are a lot of factors that make this kind of work difficult in this part of Senegal, Fatime and her colleagues tell us. Gender inequality, for one thing—women are expected to get permission from their husbands or mothers-in-law if they want to start a contraceptive method. * The facilities need more tools: more Kelly forceps, more Sims valves, more updated registers. Midwives-in-training need IUD insertion added to their curricula. Then there are the added hurdles of language barriers, superstitions, and sociocultural norms. 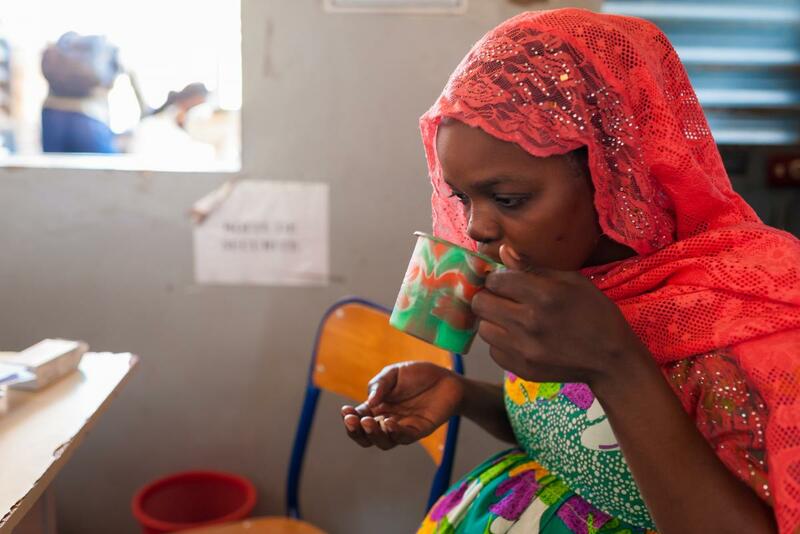 But slowly, frontline health workers like Fatou and Fatime are overcoming them. Senegal’s partnership with the US Agency for International Development through projects like Neema are leading to a more holistic approach to women’s health care—one that addresses their needs before, during, and after their reproductive years. Maternal mortality in Senegal has dropped from 401 deaths per 100,000 births in 2005 to 236 per 100,000 in 2017. Fatime finishes up with a client who has come to the health center for Implanon, a contraceptive implant. The client is 16 years old and has two children. Photo by Clement Tardif for IntraHealth International. But the policies and systems that are helping drive this decrease are only part of the reason for it. The other is the dedication of those on the front lines. Soon after that late-night boat journey, Fatou gave birth to her first child, a healthy baby boy. The woman she had saved was still recovering in the hospital nearby—she had survived, but her baby, sadly, had not. This is a wider problem that Senegal’s policy-makers and frontline health workers alike are now grappling with, after infant mortality increased slightly in the country last year. Before we leave, we ask Fatou: What’s your favorite part of being a midwife? The Neema project is led by IntraHealth International and funded by the US Agency for International Development. 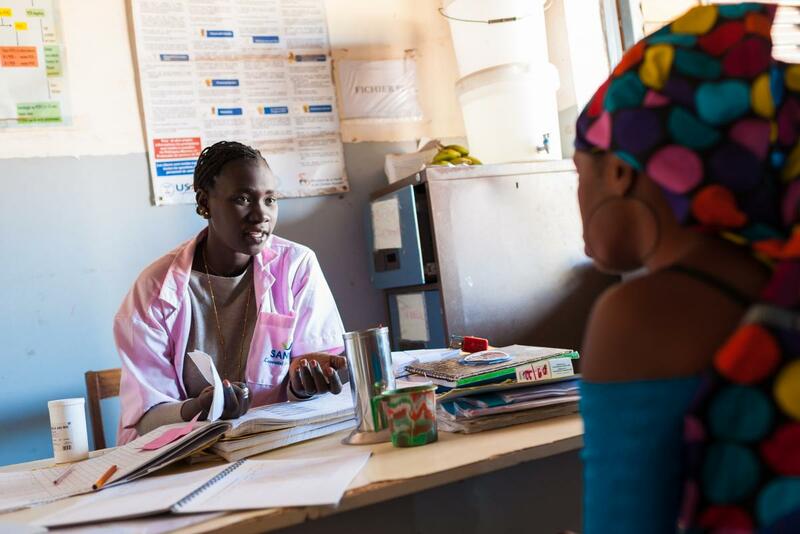 Fatou and Fatime work within teams of health workers in their facilities to improve health and well-being for women in Senegal. * A perk of post-partum family planning: it happens soon after birth, when those family members are likely to be in the health center too and can get the same authoritative information as the new moms.